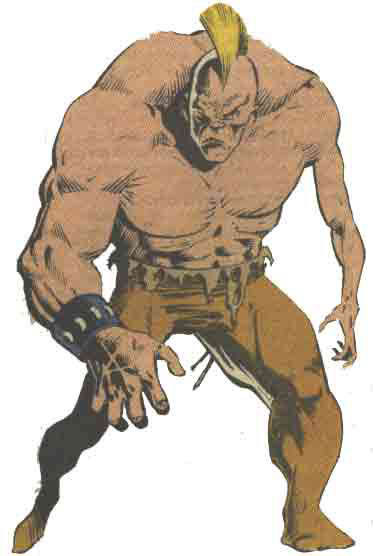 Powers/Abilities: Misfit possesses superhuman strength enabling him to lift ten tons. While enhanced by Satannish, his superhuman strength was on par with that of Wonder Man. History: (Avengers West Coast#76 (fb) - BTS) - The Misfit was once a would-be film star who went to the Power Broker to receive a superhuman build to help him in pictures, but the process was botched up, and he was left horribly distorted. (Captain America I#330-331 - BTS) - While the Night Shift assisted Captain America in raiding the Power Broker's mansion, they came across several misshapen victims of the Power Broker process who had been left horribly mutated by the process. They recruited one of these men for their team, and he became Misfit. (West Coast Avengers II#40)- When Digger was captured by Mockingbird, a former member of the Avengers, Misfit joined the Night Shift in a raid on the Avengers Compound, and fought the Vision and Wonder Man. However, he was no match for Wonder Man's strength, and was easily defeated with the rest of the Night Shift. However, the Shroud came to the rescue of his team before Hawkeye could turn them over to the authorities, creating a cloud of darkness to conceal their escape from the Avengers Compound. (Avengers West Coast#76) - When the Hangman assumed control of the Night Shift, Misfit was at first reluctant to follow his orders, but the Hangman changed his mind by choking him with one of his ropes. He then led Misfit with the other Night Shift members into a portal leading to Satannish, where they received additional supernatural power-- although, unknown to them, at the cost of their souls. Later, Misfit joined the Night Shift in an assault on the home of Stella Houston, and fought the U.S. Agent, Hawkeye and Spider-Woman. Misfit easily defeated the U.S. Agent with his newfound strength, and they brought them to the Tower of Shadows to offer them as a sacrifice to Satannish. (Avengers West Coast#77) - When Iron Man and the Living Lightning came to their allies' rescue, Misfit fled with the others as Dansen Macabre made the Tower of Shadows disappear, stranding the Avengers in mid-air. Later, Misfit joined some of the Night Shift in attacking Wonder Man, and managed to beat him unconscious. They brought him back to the Hangman, who was convinced by Wonder Man to create a film ("The Night Shift Takes Hollywood") in which their members could have their revenge upon the film industry. (Avengers West Coast#78) - Misfit took part in some of the filming for their movie, and fought Wonder Man for the cameras. In between takes, Misfit made advances at Mona, one of the crew members they had forced to work for them, but Mona rejected him. Only Wonder Man's intervention kept Misfit from lashing out at Mona. Later, they launched an attack on the filming of "The Demon That Devoured Hollywood," in which the U.S. Agent was playing the lead role, and Misfit again beat him unconscious, then placed him with Wonder Man, whose attempt to deceive the Night Shift had been discovered. (Avengers West Coast#79) - As the Night Shift continued filming, Mona led some of the other crew members in an attempt to fight them off, but they were quickly defeated. Just then, the Avengers arrived, and Misfit was struck down by Iron Man. As their battle raged on, the Night Shift learned from Dr. Strange that Satannish had taken part of their souls, and they joined the Avengers and Dr. Strange in battling Satannish, finally driving him off of the Earth. Misfit lost his additional powers, and he was captured by the Avengers with the rest of the Night Shift. (Captain America I#420) - After the Blazing Skull (Jim Scully) attacked Digger, Misfit joined the Brothers Grimm and Needle in coming to his rescue and finding that Captain America had joined Scully. 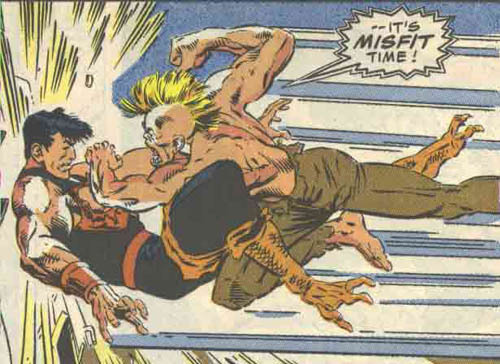 Misfit accidentally hit one of the Brothers Grimm during the fight and was then knocked out by Captain America. (Moon Knight VI#6) - Snapdragon brought Misfit and the other Night Shift members to meet with her boss who wanted to discuss why the six of them had failed to capture the two heroes. Nefaria insulted the team for their bumbling incompetence, which they took offense to. But before anyone could act, they were incinerated by Nefaria's ionic energy blast. As the Night Shift's remains continued to smolder, Nefaria turned to Snapdragon and requested she aimed a bit higher the next time she hired outside help. Comments: Created by Mark Gruenwald, Al Milgrom and Mike Gustovich. His real name was revealed in Night Shift's profile in OHotMU A-Z Update 2010#2. by Prime Eternal. Updated by Norvo (Moon Knight).